SAN JUAN, PUERTO RICO, March 15, 2018 – Today, national experts in emergency management, disaster preparedness, and resiliency joined local officials in Puerto Rico to announce a new island-wide education campaign designed to help residents of Puerto Rico take action to mitigate the impact of future hurricanes and prepare for natural disasters. 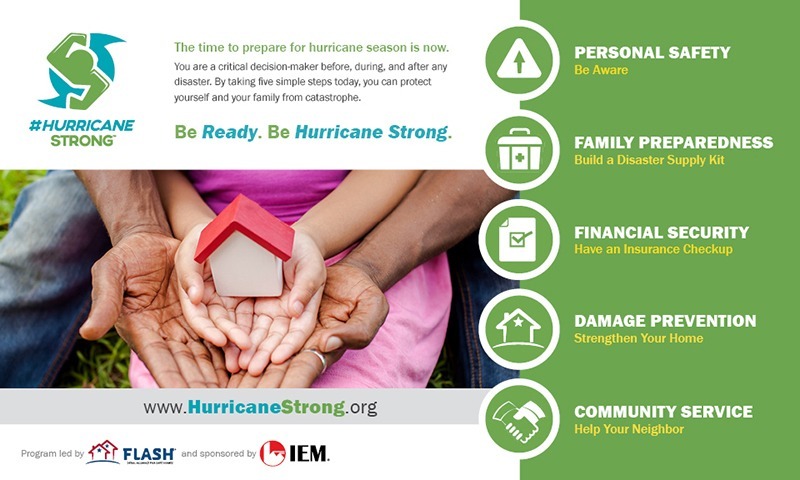 The “Hurricane Strong” effort coincides with the 6-month anniversary of Hurricane Maria’s landfall and will deliver specific, actionable information for families to take now to increase safety and reduce economic losses. The campaign is led by the Federal Alliance for Safe Homes (FLASH) and is sponsored by Innovative Emergency Management (IEM). “Hurricane Strong” is an extension of a national hurricane resilience initiative built to save lives and homes through collaboration with communities and the disaster safety movement. Specifically, the effort offers information on the five steps families in Puerto Rico must take to be prepared: Be aware; build a safety kit; have an insurance checkup; strengthen your home; and help your neighbors. Information is delivered through business summits, digital channels, home improvement store workshops, kids programming, media outreach, school lesson plans, special events, and a social media campaign featuring a #HurricaneStrong “Pose.” In Puerto Rico, the campaign will be supported through digital channels along with a paid and earned media campaign supported by IEM and Spanish-language content. In Puerto Rico, FLASH and IEM will run paid advertising online and in newspapers across the island. Click here to view high-resolution images of the ads. For more information, including Spanish-language content visit www.hurricanestrong.org. The nonprofit Federal Alliance for Safe Homes (FLASH®) is the country’s leading consumer advocate for strengthening homes and safeguarding families from natural and manmade disasters. Their mission is to promote life safety, property protection and resiliency by empowering the community with knowledge and resources for strengthening homes and safeguarding families from natural and man-made disasters. IEM is a global security consulting firm dedicated to building a safe, secure, and resilient world. A minority, woman-owned enterprise, IEM works with government agencies and private sector organizations around the world to improve protection and security for people and infrastructure and to help states, regions, and communities prepare for and recover more quickly from disasters. We integrate science, technology, and real-world experience to provide each of our customers with solutions that work and outcomes that matter. For more information, please visit www.iem.com.